China’s “2018 Government Work Report” called for China to further open up its financial sector to the world. This reflects China’s resolve to deepen reforms and continue opening up. But the push to open up is not without its detractors. These detractors generally overestimate the risks of opening up and underestimate the benefits, a sign that they are lacking “Four Confidences” — the doctrine promoted by President Xi Jinping that calls for confidence in China’s path forward — and essentially reject the results of China’s past 40 years of reform and opening-up. Looking back on past reforms shows that opening up has not had a systemic negative impact on China’s financial sector. Rather, it has driven development and progress in the country’s financial system. Reform requires opening up, and opening up also requires reform. Openness to the outside world happens on two levels. The first is welcoming foreign investment organizations into the country while domestic ones head abroad. The second is respecting and adapting international market rules and practices while developing the domestic financial market. The ability of China’s financial sector to see such remarkable progress over a short period of time is in large part due to how it opened up, driving domestic reforms. Opening up promotes the financial system’s competitiveness and stability, lowering fundamental financial risk. It not only attracts funds, but also promotes deeper progress in financial-sector reforms, including those relating to ownership rights and corporate governance structures. When the Asian financial crisis erupted, China’s large state-owned commercial banks improved their competitiveness and stability through decisively introducing foreign strategic investors and reorganizing financial affairs, among other methods. Additionally, after promoting structural optimization and product innovation in the financial market, it becomes dramatically more efficient in servicing the real economy. The stock market first allowed foreign investors into the bond market through the Qualified Foreign Institutional Investor program in 2002. Access has been broadened through channels like the Renminbi Qualified Foreign Institutional Investor program, and the mainland-Hong Kong Stock Connects. The interbank bond market is already fully open to qualified foreign investors, and foreign and domestic organizations now face the same criteria for being admitted into the market. Opening up has also strengthened China’s authority in international affairs. China’s monetary policy and financial regulation, especially since the 18th Party Congress, have become aligned with international standards while remaining grounded in China’s particular characteristics and circumstances. The country has explored the construction of a macro-prudential policy framework and finished the construction of important market infrastructure. With the inclusion of the yuan in the International Monetary Fund’s Special Drawing Right basket of currencies, China’s status in the governance of the global financial system is growing. The main problem with China’s financial sector at the moment is an inadequate, rather than excessive, opening up. The level of openness in China’s financial sector is incompatible with the country’s status as a world power that wields global influence. As the world’s second-largest economy and its largest exporter, China’s level of financial openness is not only lagging far behind the main developed economies, it has even been surpassed by many developing countries in recent years. Even in comparison with other industries, the financial industry in China is relatively closed. Foreign financial institutions account for a small share of the Chinese market. Even in the most-open market — the bond market — the breadth and depth of opening up is far from sufficient. The systematic causes affecting China’s ability to open up its financial sector are the areas that must be targeted by the upcoming period of reforms. Financial institutions’ corporate governance structures must be improved. In recent years, China’s financial organizations’ corporate governance structures have faced the problem of the reality not matching the appearance. Manipulation by majority shareholders and meddling by external parties are among other serious problems that keep institutions from meeting the standards of modern businesses. Additionally, unlike mature markets abroad where innovation is largely market-driven, in China the financial market’s innovation mechanism is insufficiently flexible, has overly high barriers to entry, and lacks impetus, causing the market to have a relatively low level of development. Some financial products are still in the early stages of merely imitating overseas products, and are unable to match the consumption habits, culture and purchasing power of Chinese consumers. The regulatory environment also needs further improvement. Accounting, auditing, taxation, law and other systems, as well as the financial market’s infrastructure, are poorly integrated with the rest of the world, hampering the development of financial institutions and the financial market. China still suffers from the problem of poor transparency and a low level of openness when it comes to financial organizations’ qualification for special services and the licensing process. Some mistaken perceptions are caused by a lack of the “Four Confidences,” and are essentially a covert rejection of the results of China’s past 40 years of reform and opening-up. In recent years, in the process of promoting the opening of the financial sector, there have been some specious points of view, or even suspicions and conspiracy theories. The first kind of naysayer misunderstands the relationship between financial openness and financial safety. Some believe that opening up will inevitably bring a substantial increase in financial risk, causing financial instability or even a crisis. Others say that maintaining a relatively low level of openness in the financial sector would make preventing risk more convenient, and increase financial safety. Some even believe that China’s ability to withstand the Asian financial crisis and the most recent financial crisis comes from the country’s relative isolation and lack of openness. In reality, opening up to the rest of the world is not in itself a cause of financial risk. On the contrary, opening up more will help raise financial institutions’ competitiveness, dissolving and guarding against financial risk on a fundamental level and protecting the country’s financial safety and stability. Even more worthy of mention is the fact that a lack of openness in the financial industry makes it even more likely that risks will accumulate, threatening financial stability. Policies that oppose opening up in order to prevent a financial crisis will not only weaken the effectiveness and competitiveness of China’s financial organizations, they will also cause the country to lose its ability to face financial risks and crises, and cause its financial market’s capabilities to weaken while lessening the efficiency of its resource allocation. As a result, China’s economy and financial system will fall behind its foreign counterparts in terms of global competitiveness. The second kind of naysayer is unable to distinguish between the upside and downside, and between cause and effect. Some believe that the detrimental effects of opening up to the rest of the world outweigh the benefits, and that opening up is fundamentally incompatible with the development pattern of China’s financial industry. Furthermore, some support conspiracy theories that say opening up is merely a trap meticulously crafted by Western countries. In fact, promoting reform and development through openness is an inherent requirement for the development of the financial industry, as well as a necessary choice for actively preventing and resolving systemic financial risks. It is necessary to continuously improve the efficiency and vitality of the financial industry through full competition. To some degree, being more open to the outside world means the introduction of new competitors and new competition mechanisms. The market becomes more competitive, more conducive to the development of financial innovation and to the effective allocation of resources. Lack of competition can breed complacency, lead to high leverage, bad loans and other negative phenomena. For developing countries, becoming more open to the outside world can result in the introduction of advanced international management concepts, technologies and models to improve the financial system’s efficiency and stability. At the same time, the process of integrating into the global economic and financial system brings certain market risks. In particular, closer links with the international financial market will create increased flow of capital and other financial elements, increasing the impact on China of fluctuations in the international financial market. With regard to this, China should acknowledge the existence of financial risk. Proper disclosure of risk is an important measure to effectively reduce systemic risk. The third type of naysayer misunderstands what opening up to the world involves. Some believe the financial industry has opened up too much, causing the country’s macro-control ability to fall. Some others regard the relaxation or elimination of the ratio of foreign-capital stocks in financial institutions as a curse that may not only cause the loss of national wealth, but may even result in an overall loss of control of the economy and financial market during unusual phases. In reality, opening up to the outside world does not necessarily mean releasing all brakes. Instead, it should involve promoting domestic reforms, continuously improving the country’s macro-control capabilities, and promoting the modernization of the country’s governance system and capabilities. The Communist Party’s Central Committee and State Council attach great importance to the work related to opening up the financial industry. According to China’s 19th Party Congress work report, the country must promote the formation of a new pattern of comprehensive opening up, greatly ease market access, and expand the opening up of the service industry. Expanding the opening of the financial industry to the outside world is valuable for the sustained and healthy development of the Chinese economy, and is a basic principle that China will always adhere to in the future. Going forward, we must adhere to the direction of opening up to promote reform and promote development. 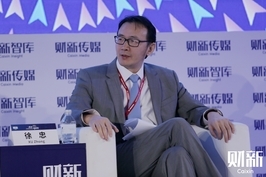 Xu Zhong is director general of the research bureau of the People’s Bank of China. This article was originally published in the Economic Daily, and has been translated from Chinese and edited for clarity and length.